Above - The Opera House, Manchester during the run of 'Anything Goes' in April 2015 - Photo M.L. 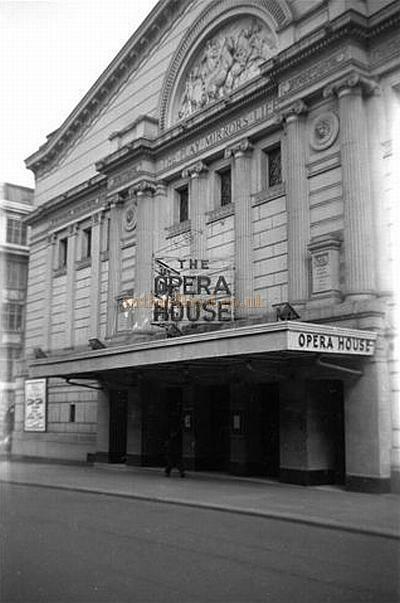 The Opera House on Quay Street, Manchester was built in 1912 by Farquharson, Richardson & Gill and originally opened as the New Theatre. 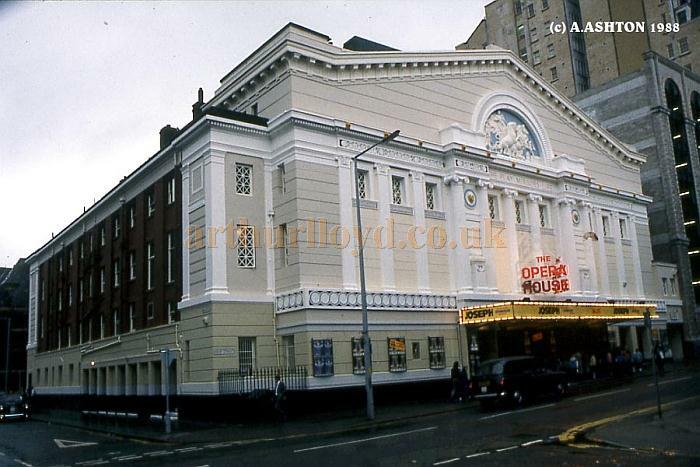 Right - The auditorium and procenium arch of the Opera House, Manchester in 1980 - Courtesy Ted Bottle. The Theatre became the New Queen's Theatre in 1915, and didn't actually become the Opera House until 1920 under the ownership of John Hart and his associates of the United Theatres Ltd.
Left - A Programme for Prince Littler's 'Glamorous Nights' by Ivor Novello, a transfer from London's Theatre Royal Drury Lane, at the Opera House, Manchester in February 1936. In 1931 it was bought by Howard & Wyndham Ltd, led by A. Stewart Cruikshank from its headquarters in the King's Theatre, Edinburgh. The impresario and musical doyen Charles B. Cochrane, who was now a director of Howard & Wyndham Ltd, became a visiting producer. 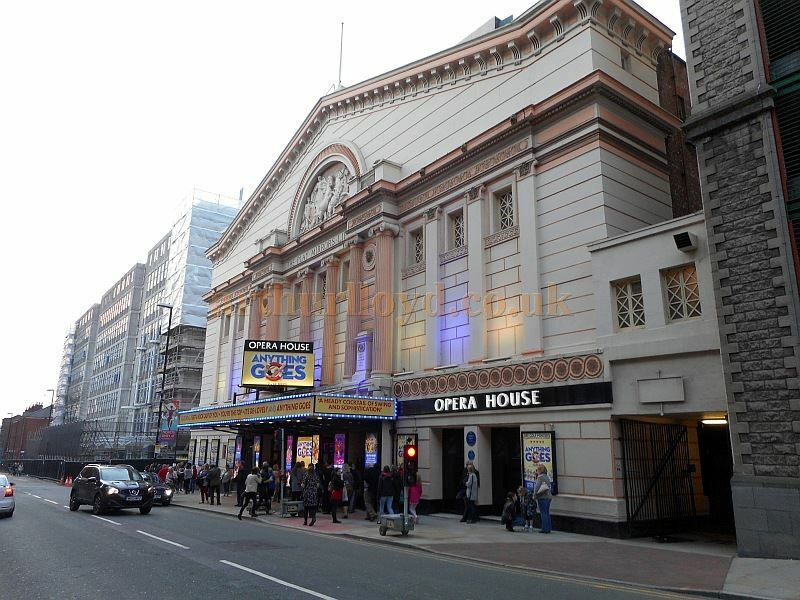 The Theatre was Manchester's main Touring House until 1979 when it closed and was converted for Bingo use but this lasted for only five years and in 1984 it was bought by the Palace Theatre Trust, who had previously saved the Manchester Palace Theatre, and live Theatre was then reinstated at the Opera House. 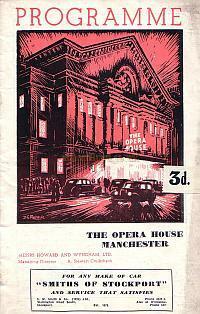 Above - The Opera House, Manchester during the run of Can-Can on the 9th of April 1956 - Courtesy Gerry Atkins. 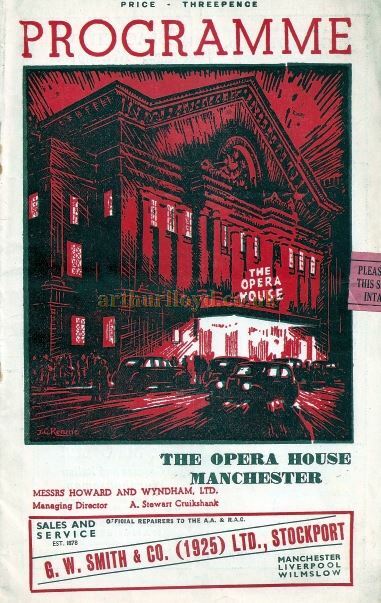 And a Programme for 'Idiot's Delight' at the Opera House Manchester in March 1938 - Courtesy Michael Jaffé whose Grandfather Carl Jaffé was in the cast. The Opera House has a very large auditorium with two cantilevered balconies, each with a capacity of around 500, but because of their size they have rather restricted sight-lines to the rear. 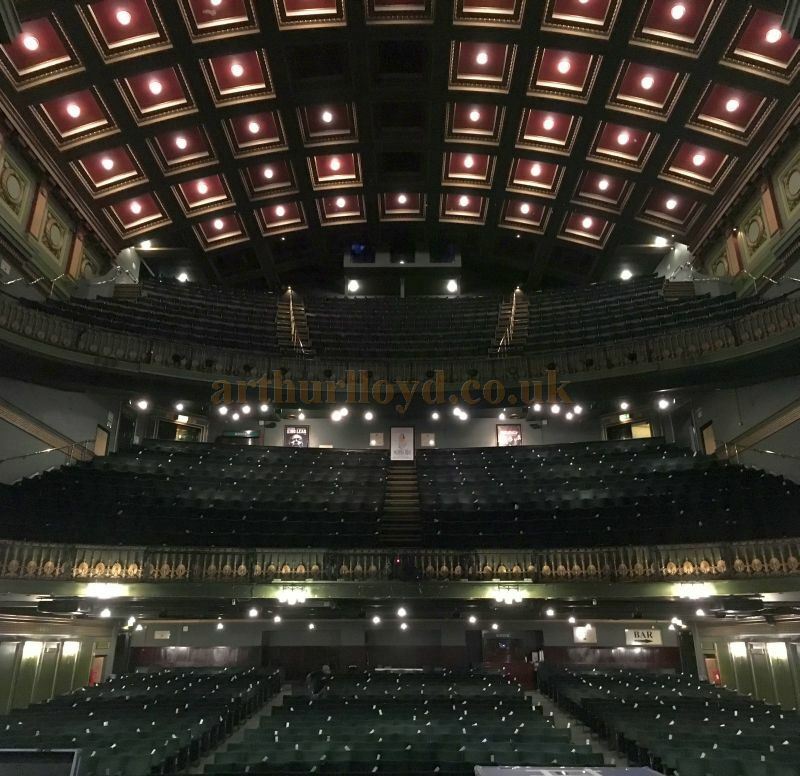 The Theatre's current capacity is 1,920. Above - The auditorium of the Opera House, Manchester in 1980 - Courtesy Ted Bottle. Some of the information for this Theatre was kindly sent in by Graeme Smith. 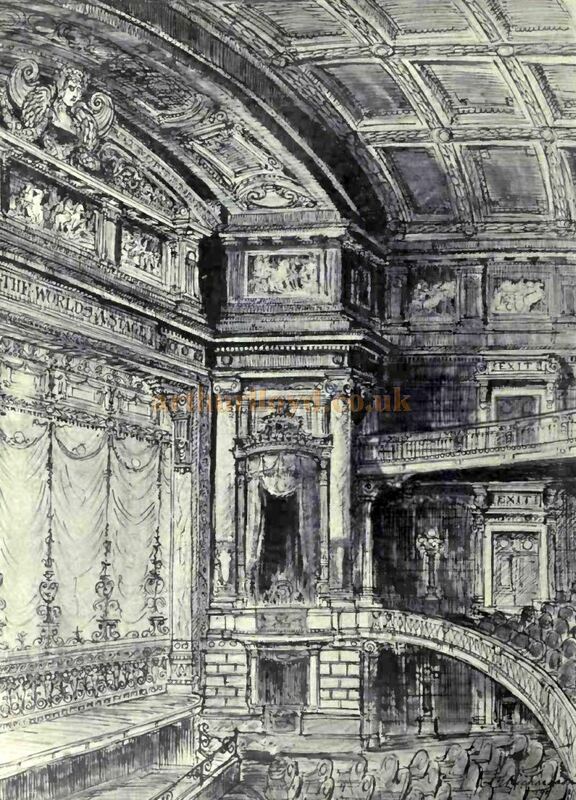 Above - A Sketch of the Auditorium of the Opera House, Manchester - From the Academy Architecture and Architectural review of 1912. 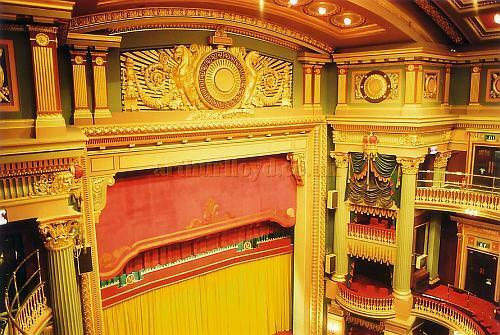 The caption for the image shows the proposed name of His Majesty's Theatre although this was never used. 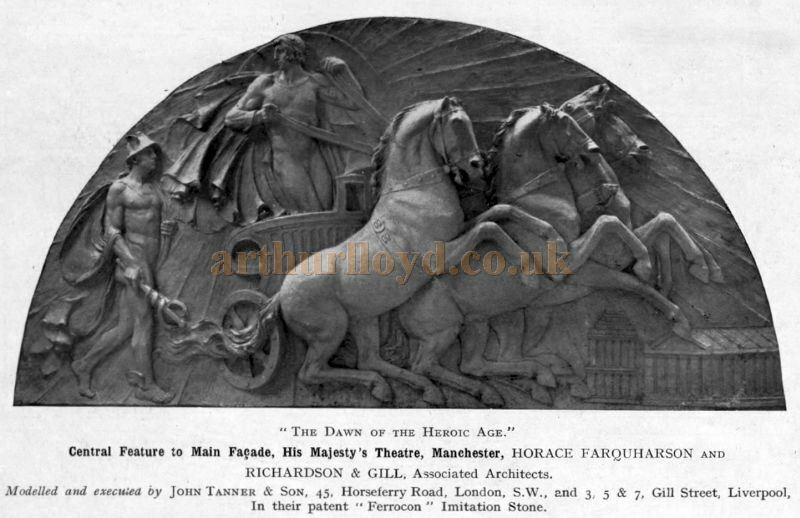 Other information in the caption states:- Horace Farquharson and Richardson & Gill, Associated Architects. Modelling, Fibrous Plaster Work and Painting Decorations by John Tanner & Son, 45, Horseferry Road, London, S.W. and 3, 5, & 7, Gill Street, Liverpool. 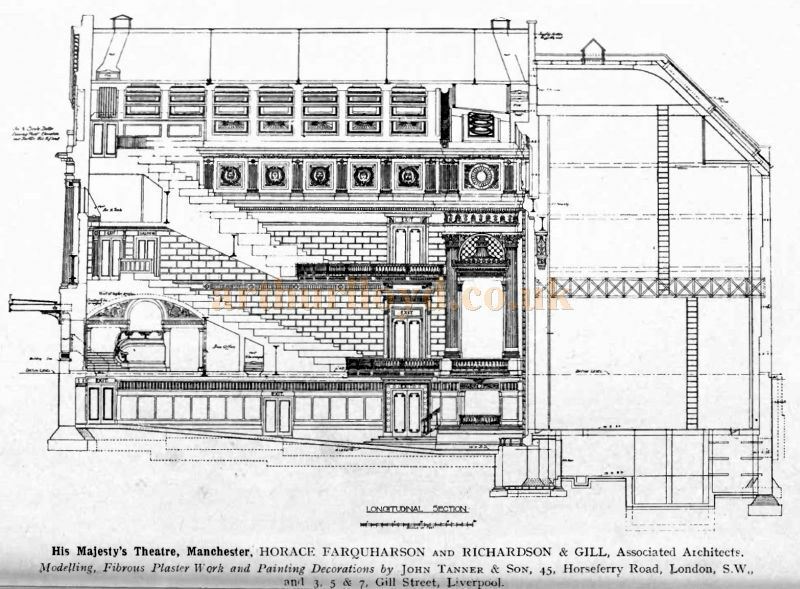 Above - A Plan of the Opera House, Manchester - From the Academy Architecture and Architectural review of 1912. 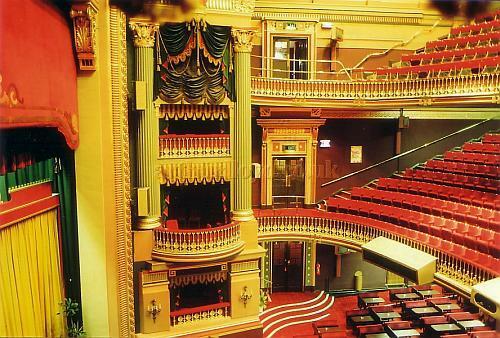 The caption for the image shows the proposed name of His Majesty's Theatre although this was never used. 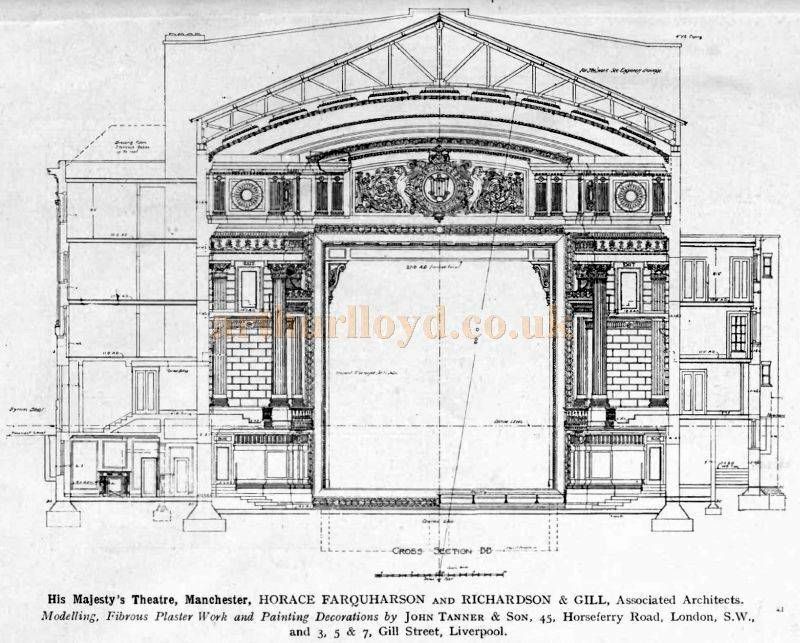 Above - The Central Feature of the Main Facade of the Opera House, Manchester, still in place today - From the Academy Architecture and Architectural review of 1912. 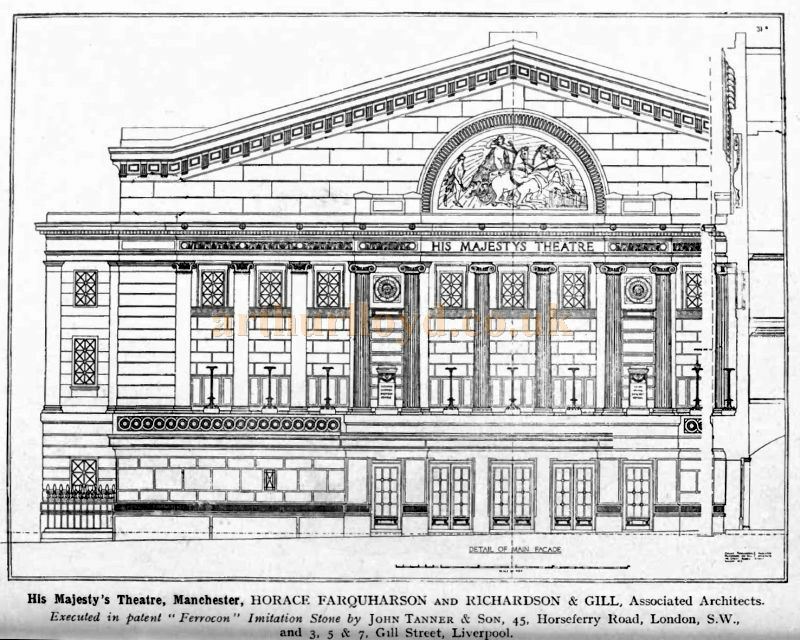 The caption for the image shows the proposed name of His Majesty's Theatre although this was never used.